Guided Access is an iOS feature which allows you to manually lock your device down to a single application. This disables the Home button, the Notification Center (shown by swiping down from the top of the screen), the Control Center (shown by swiping up from the bottom of the screen), and any shortcuts that could otherwise be used to exit the app if using an external keyboard. In the iOS Settings menu, select General. Select Guided Access and turn it On. Set Mirror Display Auto-Lock = On (devices running iOS 12.1.1 or later). This prevents the device from being put to sleep after 20 minutes of inactivity, regardless of Auto-Lock settings. Guided Access requires that you set a passcode to unlock the device. 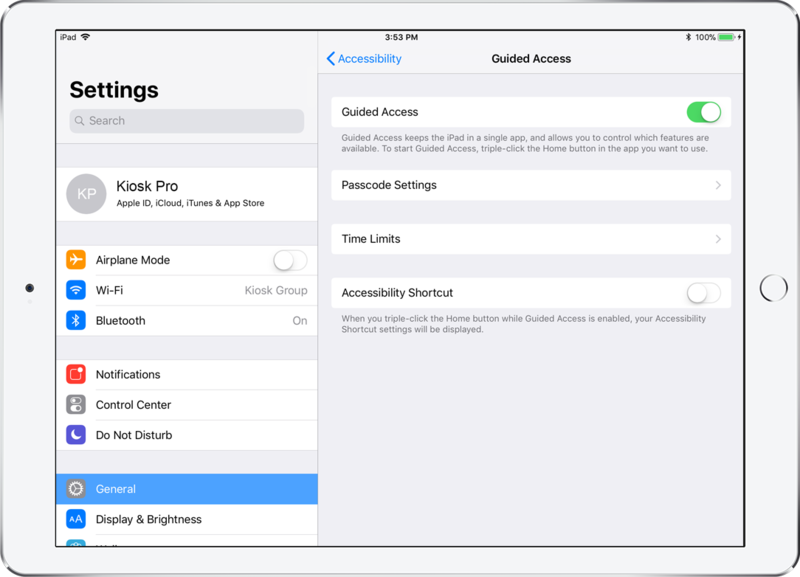 This can be done globally for the iPad in the main Accessibility settings (which we recommend as there's less chance of making a mistake or setting an incorrect passcode if you only have to set it once) or individually each time Guided Access is started. Once Guided Access is enabled, you can launch Kiosk Pro and start Guided Access by triple-clicking the physical Home button. For iPads without a physical Home button, you will start the Guided Access session by triple-clicking the power button on the side of the device. For most kiosk applications, you will want to leave touch turned 'ON' and not disable any of the screen by circling. To exit Guided Access, triple-click the Home button (or on devices that do not have a Home button again, the power button) and enter the passcode. The on-screen notifications when a user touches the Home button cannot be turned off and may or may not work for your intended kiosk presentation. As this is part of the operating system, it is not something we can change from within the app. If you forget the passcode to exit Guided Access, you can unplug the device and let the battery drain completely. When the device is reconnected to power and boots up, it will return to the device's Home screen, not the app. If you'd prefer to reboot into the app in that situation, Apple offers an option called Single App Mode specifically for for corporate devices. If you need additional details, here are Apple's official instructions on how to set up Guided Access.